I was just expecting to stop in for one drink at Huckleberry’s after a busy first day of our most recent trip. I ordered a Rusty Nail (Scotch and Drambuie for those of you who don’t know what comprises this classic yet forgotten cocktail) while my friend pondered his options. 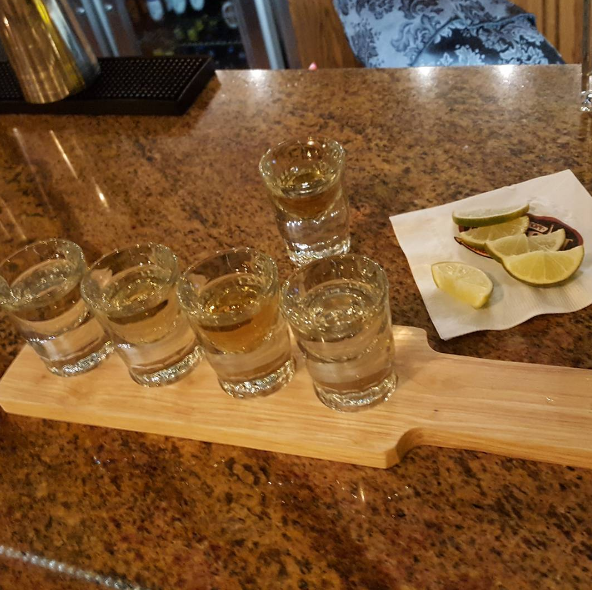 The featured drink of the day was a “flight” of tequila. For $25, you get four half-shots of different tequila by Kah (a.k.a the ones in those beautifully decorated skull-like bottles) and then a quarter shot of their top Anejo, which sells for over $200 a bottle. It seemed too good to pass up, so he ordered that. The bartender, Heather, was so pleasant and chatted with us. We were the only two people in the bar at the moment. She brought over an endless amount of lime wedges and a salt shaker so he could get through his tequila. He loved it. Meanwhile, as I finished my drink, I pondered doing the same thing. I’m not much of a tequila guy, so I worried that the assortment would be lost on me. I then just happened to say, “You should offer flights of whiskeys too”. That’s when she said that they have multiple flights and could customize them any way I wanted. There was a Scotch selection, Bourbon, and even one for all the different Crown Royals. 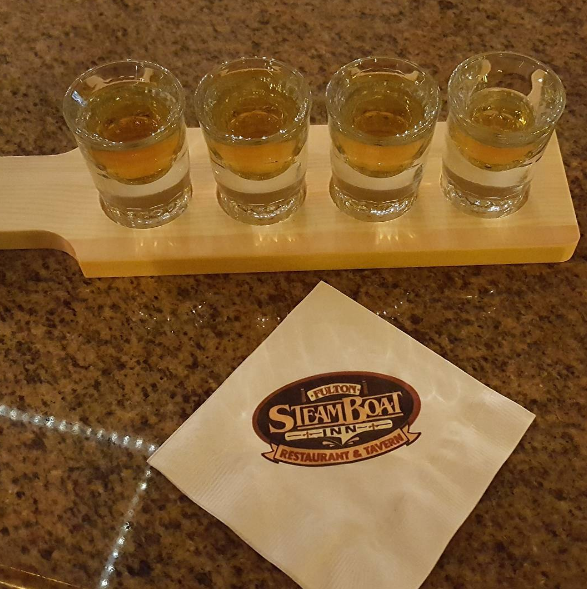 I went with the Scotch flight, which included a shot each of Johnnie Walker Red and Black Labels, followed by a shot of Oban 14-year-old. It was then capped off with a half shot of Johnnie Walker Blue Label. This was also priced at $25 and well worth it. A shot of Blue at Huckleberry’s goes for $35 if I remember correctly. Most restaurants in New Jersey get over $50. This is ironic considering the price difference by state. In my home town, I can get a bottle for $180 whereas Pennsylvania runs over $220. Needless to say, this was too good to pass up. I have Blue at home (a graduation gift from my family) but I rarely drink it because of how special it is. Meanwhile, Black Label is my favorite Scotch and I had never tried Oban before. That was actually amazingly smooth, and I would put it up there with the best Scotches I have ever had. These flights should be sipped, not thrown back. For veteran drinkers, it is an affordable way to get yourself a taste of your favorites For novices, it is worth it just for the chance to do a tasting and not break the bank. He isn’t even much of a drinker, so I was floored when he went for the tequila shots. His flight being the special also meant he got a Kah t-shirt and skull necklace. As for me, I left with the satisfaction of knowing this small hotel bar offers something incredible. If you’re staying there or not, do drop by and get yourself a flight. Hopefully Heather will be your bartender. We talked with her for over an hour. She was so nice it made our trip complete. When we were in on the last night of our trip and told her we would be leaving the next day, she came out from around the bar and gave us a hug. I do hope this post finds its way to her, or whoever runs Huckleberry’s.